Our Dinosaurs for Kids offers a feast of activities perfect for all dino fans. There's plenty of suggestions here to keep any young dinosaur addict happy for days! 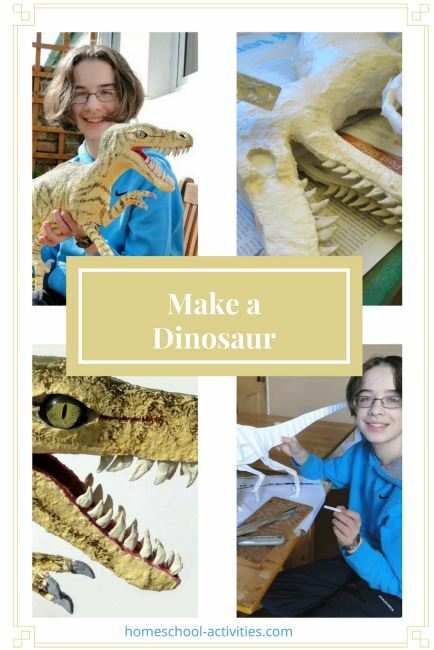 One of the nicest ways for older children to enjoy dinosaurs for kids is to build your own fabulous prehistoric beast using paper mache clay. 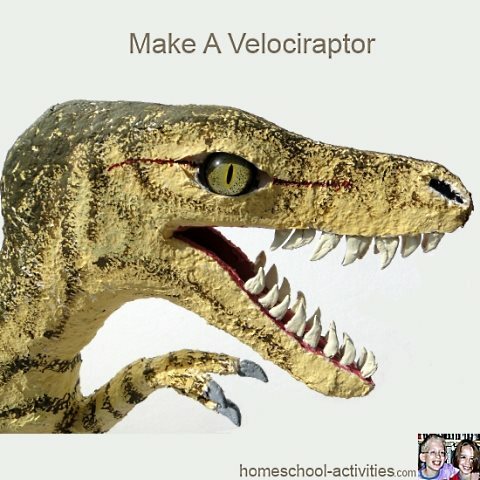 See how to make a dinosaur with a video of our homeschool Velociraptor coming alive! How about starting your dinosaur activities by digging one up? 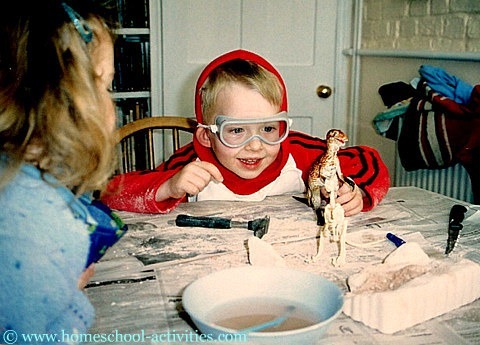 My children William and Catherine loved it as you can see in our page on preschool science, especially when we added homeschool goggles and a hammer! If getting a kit takes too long to organize, you can always start right now by enjoying a virtual dinosaur dig at the Smithsonian. 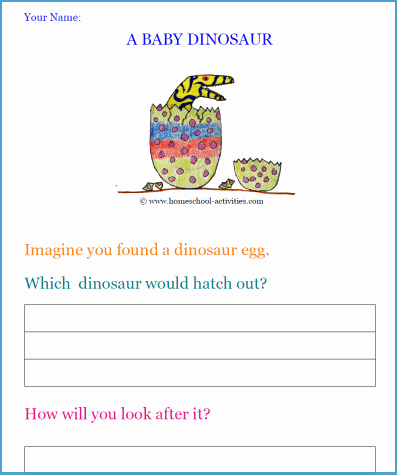 There are lots more activities you can try to bring the past to life on our baby dinosaurs page, where you can even make your own dino egg. You could start your homeschool activities by looking at which dinosaurs lived in your State with this great kids dinosaur map of each state. 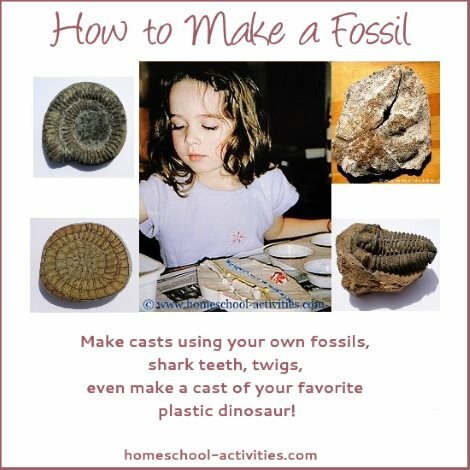 If you can't go on a fossil hunting trip near you, you can always make a fossil yourself! Next, pick your Dinosaurs for Kids Period - Jurassic, Cretaceous or whatever catches your eye. 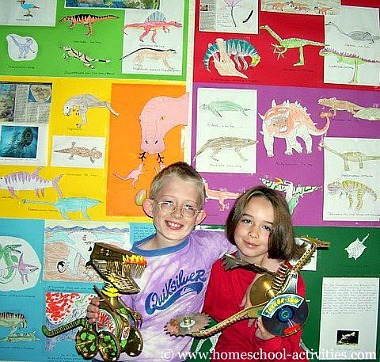 Naturally enough, we thought we'd start our homeschool curriculum activities before the dinosaurs and led up to their arrival but you could choose anywhere. Obviously, any family who follows a strict Biblical belief would have to adapt their homeschooling curriculum to suit their own interpretation. Melbourne Museum has a great timeline which your kids could use to decide where they want to begin their homeschool science curriculum. Start drawing! You'll need a few good library books to give you an idea, but since no one really knows what they looked like there's plenty of scope for interpretation! Depending on the age of your child, you'll be happy with anything from a big red splodge upwards! 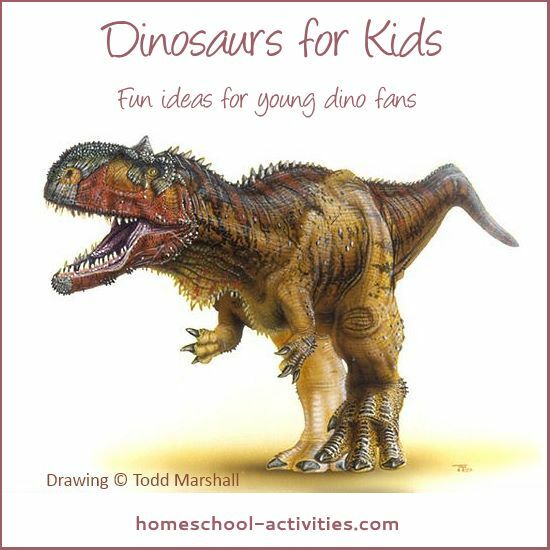 We can show you how using geometric shapes can help your child learn how to draw dinosaurs. You can also have fun with one of our favorite kids art activities - making up your own beast from bits of your favorites! 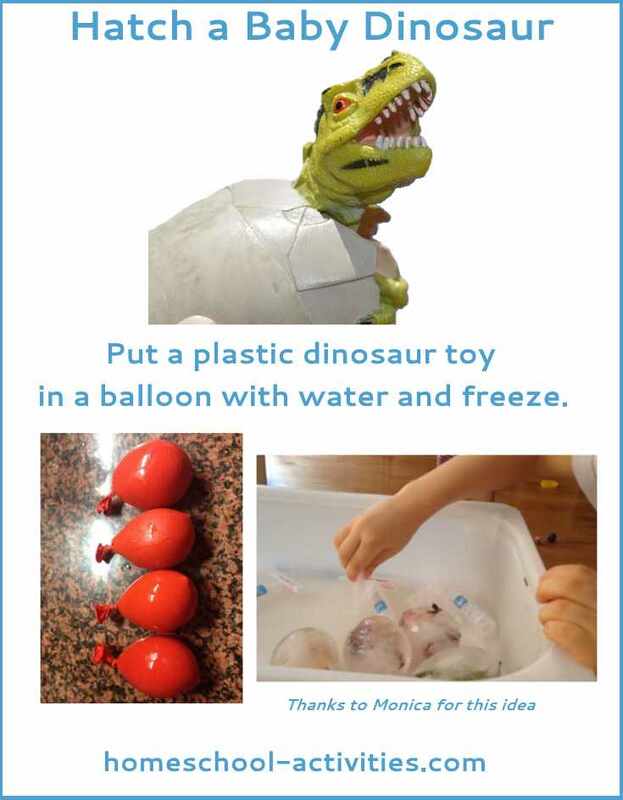 And you'll see how to make your dinosaurs come alive with tabs and pop outs in our kindergarten activities. 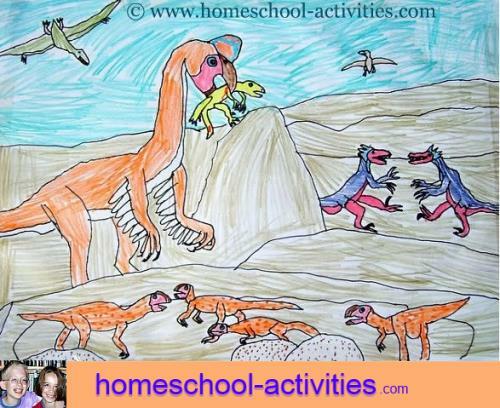 The kids-dinosaurs site has some great dinosaur coloring pages and facts to help you. 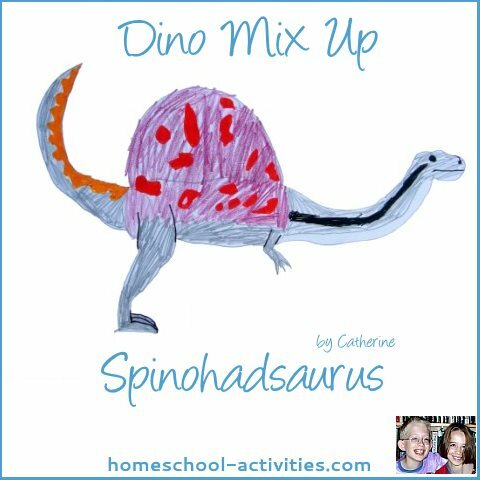 Catherine loves coloring, as you'll see in her free homeschool dragon drawing tutorial, and she's illustrated three special dinosaur story writing worksheets so you can add to your dinosaurs for kids project with your own story about bringing up a baby dinosaur. Older kids will enjoy Dinosaurs for Kids activities by writing about toilet training and common illnesses using Catherine's how to keep dinosaurs free story sheet. You're going to need some large colored cardstock so you can stick all your activities down. If you come visit me, you'll be sitting on the sofa surrounded by wallpaper covered in the Story of Life! 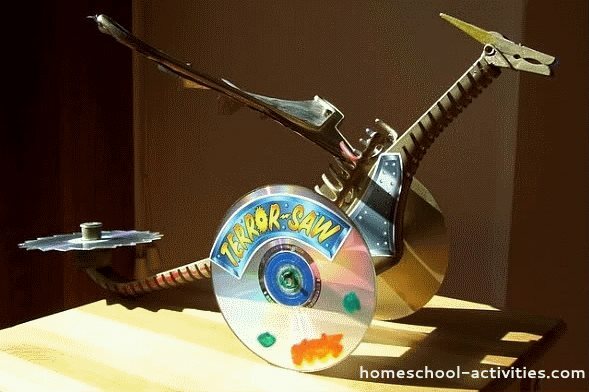 But you can turn your activities into a giant dinosaur lapbook full of all sorts of different dino memorabilia. You've started with some drawings; now's the time to add in some more exotic elements. Sponge (Cambrian). Sadly I found we had some real sponge dredged from the seabed but the bathroom sort would do. 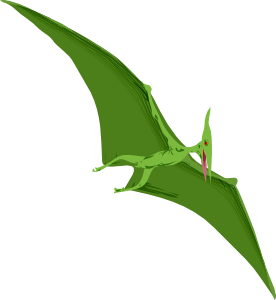 Ginkgo leaf (Triassic). We used a homeschool laminated one. Feathers (Jurassic). We stuck down artificial ones because they had pretty colours! Piece of Magnolia tree (Cretaceous). 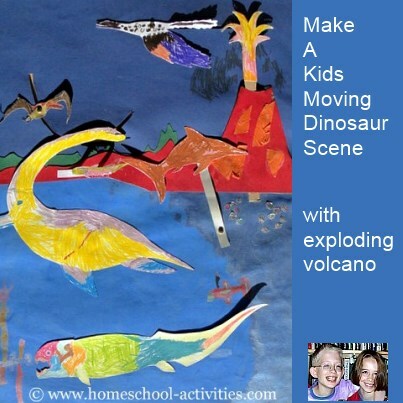 A great way to get everyone in the mood for homeschool dinosaurs for kids activities! What happened when the Brachiosaurus took the train home? He had to bring it back! Why not look up some dinosaur jokes and add them to your lapbook? You could save the best and add them into homeschool Christmas crackers. 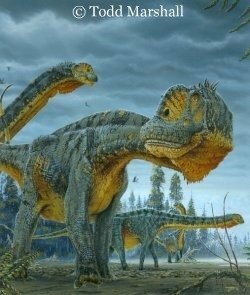 If you want William's favorite, have a look at the baryonyx mystery (UK only). Dino Run is a Catherine favorite where you escape extinction by dodging meteorites and the doom wall. But if you want Catherine's overall winner, it's the Extinct Animals expansion pack for Zoo Tycoon 2 where you get to look after dinosaurs, set up their enclosures, and name the babies. More games in our page on dinosaur activities. The kids thought it'd be a brilliant idea to send you a page they found on dinos. Do you mind adding it? They'd feel so accomplished knowing your other web visitors could learn from it too. Have done Courtney! So pleased you like the page and I think your class are brilliant to have got to such a level of interest! 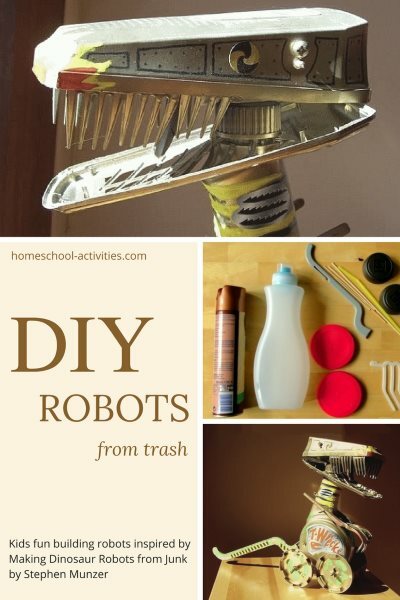 We'll be showing you lots more dinosaur kids activities, including how to build a dinosaur robot, in our page on dinosaur crafts.